“Jornadas de Filosofia is a seminary academic tradition wherein seminarians are given the avenue to concretely apply and showcase what they have learned in their philosophical studies through varied activities,” said Fr. Anthony Irineo, OAR, the seminary’s dean of studies and senior high school principal. For this year, following the suggestion of Fr. Irineo, the seminarians were divided into four fraternidades (fraternities) that bear the name of different devotions to Jesus, namely: Fraternidad de Jesus Nazareno, Fraternidad de Sto. Niño, Fraternidad de Cristo Rey, and Fraternidad de Jesus Divina Misericordia. Fr. Irineo personally appointed 4 fourth-year seminarians to act as capo (head) of each fraternidad and another 4 third-year brothers as vice capo. Then the rest of the community were drafted randomly by the four fraternities through drawing of lots. Fr. Irineo said the fraternidad membership will be a permanent grouping assignment for the seminarians during their entire stay at Casiciaco, and only the incoming neophytes will be drafted by drawing lots each succeeding year. Br. 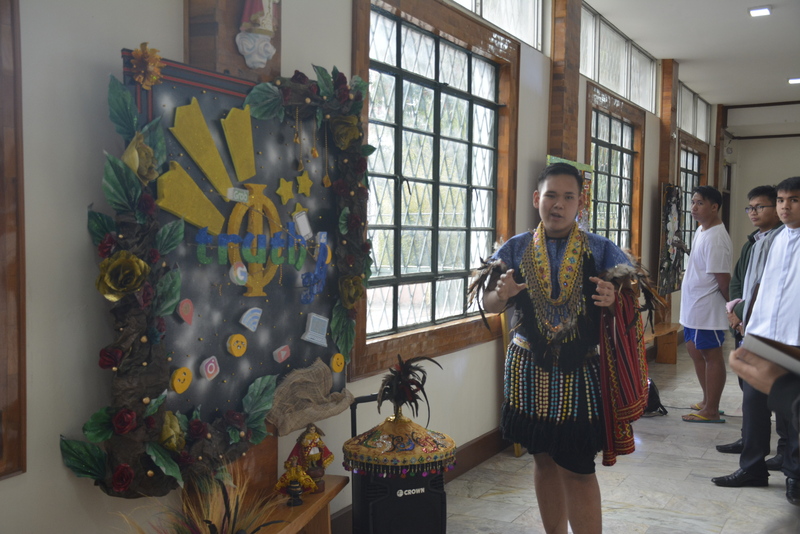 Marco Paolo Renacia of Fraternidad de Cristo Rey explains their bulletin board exhibit, which eventually is declared winner of the contest. The first day of Jornadas Filosofia featured an exhibit contest among the four fraternities on the theme of the activity. Each group was assigned a bulletin board nailed along the classroom corridor. With creativity and collaborative spirit, the fraternities came up with exhibits that utilized recycled and environmentally friendly materials to project designs that spoke of the role of philosophy in the ever dynamic progress of culture, language and media. The artistically gifted seminarians relished the opportunity to showcase their gifts of creative expressions. But it was not a one-man show, for all members of the groups were just glad to lend a helping hand, doing whatever little things that they could do for the bulletin board design. Some of these designs were Japanese floral origami, photo collage and many more. During the judging of the exhibit on the first day of the Jornadas, the group concepts were explained by a representative of each group. The judges, all religious formators, visibly had a hard time in determining the winning group. But Br. Ioannes Arong, the representative of the Fraternidad de Jesus Nazareno, said winning the contest was not the point. Indeed, the philosophical exhibit is a good start to the weeklong activity and properly set the mood for this year’s Jornadas de Philosofia: competitive but all in the spirit of brotherly fun and collaborative learning. Photo Caption: Br. Kline Kysser Asentista of Fraternidad de Sto. 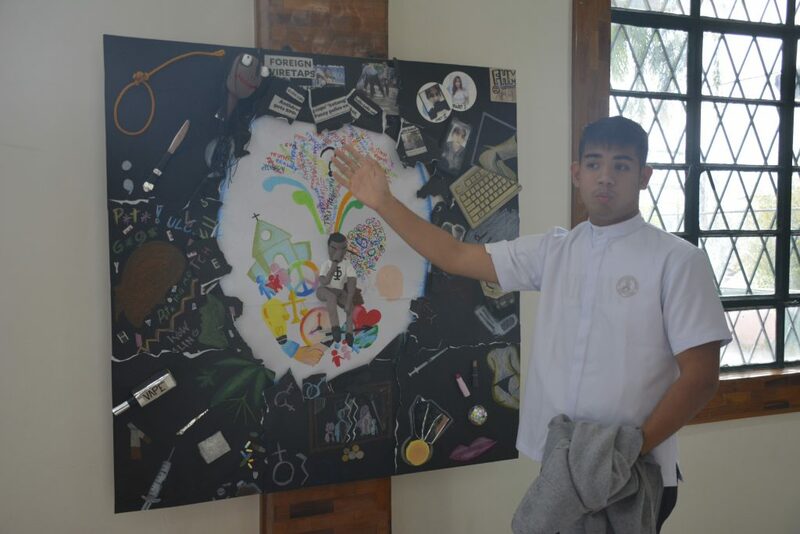 Niño gives an explanation of the fraternity’s exhibit during Jornadas de Filosofia 2019.